2/1 Open19:30 Start20:00 Advance ticket and Ticket on The Day are both 3,000 yen + tax. Hideki Tachibana (as), Shinnosuke Matsubara (as), Akira Kito (bs), RIO (bs), Yoichiro Kita (tp), Misaki Ishiwata (tp), Nobuhiro Nakane (tb), Yasuyuki Takahashi (tb), Koichi Yamaguchi (p, key), Akihiro Ishiwatari (g), Ippei Kato (g), Hiroshi Higo (b), Mariko Kobayashi (b), Keisuke Ohta (vln), Jun Isobe (ds), Naoki Yamamoto (ds), Daisuke Fuwa, Toyo, Jun Wakabayashi, Sugako, Pero. *Advance tickets will start selling at the Shinjuku Pit Inn at 1 PM on January 2, Wednesday (we accept reservations). 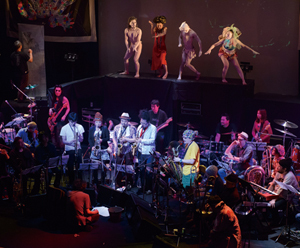 Shibusashirazu Orchestra incorporates various elements beyond genre, from jazz, rock, Latin, folk songs to enka songs as well as Butoh dance and the scenographic art, all blended together into their performance to create a piquant entertainment on stage, which is also radically avant-garde. They are a great underground subculture group as well as the experience-based entertainment. Their performances have been enchanting not only the music fans but also a wide range of audience including the fans of theater plays and Butoh dance with their overwhelming power.